Casa Insurgentes is a thousand-resident complex placed around a circular central transportation hub, Plaza Glorieta in Mexico City, Mexico, which intermediates Avenida de los Insurgentes, the second longest avenue in the world. The studio required an intervention which could reinvigorate the possibility for experimental collective living. The concept for this project emphasizes mixed income living and market ethics. Tenants of differing wealth classes converge into spontaneous negotiation. However, the project is not about class confrontation but rather social mobility—a grass-roots led development. A voluntarily-paid higher price is symbolic in the sense that it can subsidize a number of units along the same horizontal datum. This local subsidy is regulated by such 'patron units'—sparking incentives for respect, cooperation, and coexistence. It follows that the architectural vocabulary speaks through different scales and manifests itself in the detailing that reflects a consistent syntax. Tectonics aim to discretize a continuous surface, suggesting a consistent formal unity. To lower costs, a trade-off is made using inexpensive standard materials in a clever assembly. The railing spindles are merely cold rolled steel angles; only the rail itself addresses an ergonomic materialism. The idea is that architects can generate more agency in real estate with the right alignments of labour and capital. Casa Insurgentes is a means to localize cultural values without bureaucratic imposition. Such a finance model can mitigate the risk of power consolidation by political alignment with special interests. 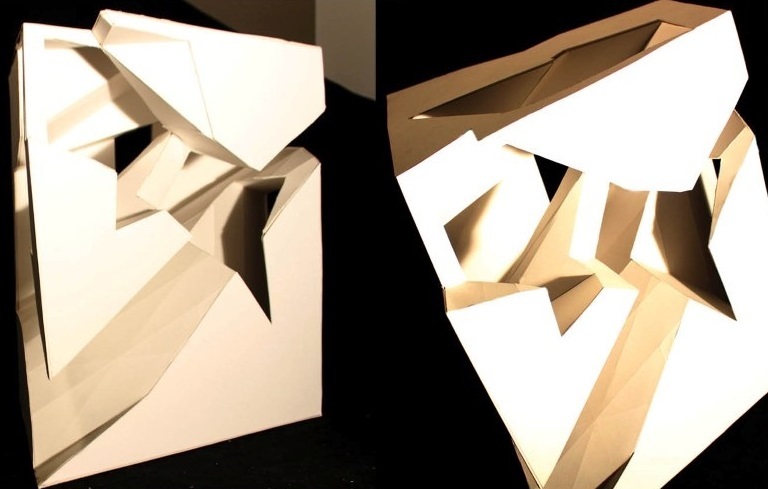 The studio initially focused on parametricizing space with particular mindfulness to algorithmic spatial programming as opposed to the generation of geometry without architectural input. 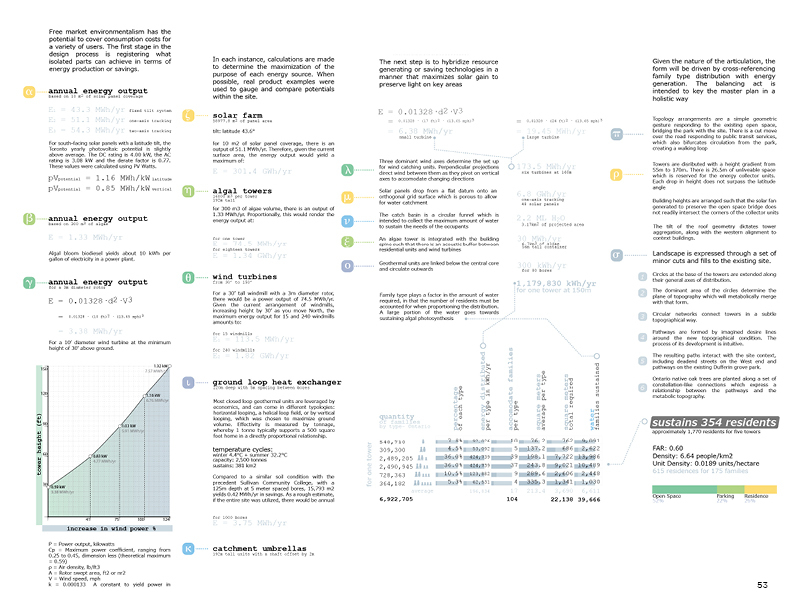 Units are designed individually with hand-drafting whereas the form itself is a result of a flexible algorithm. 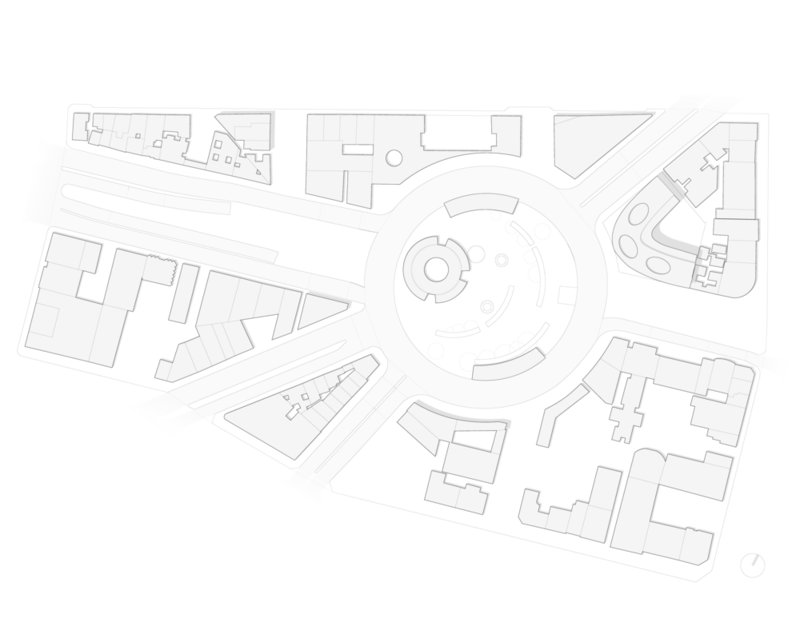 The central focus is a comprehensive set of plans and a section. 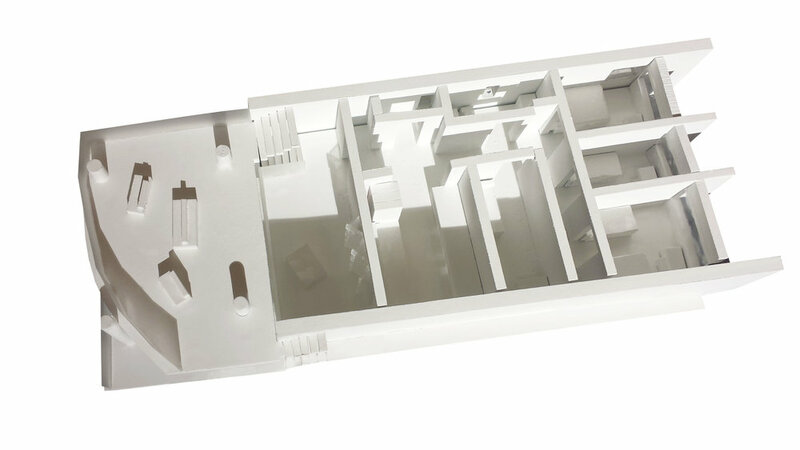 A 1:250 site model and 1:50 single unit model show the form and experience of the space. 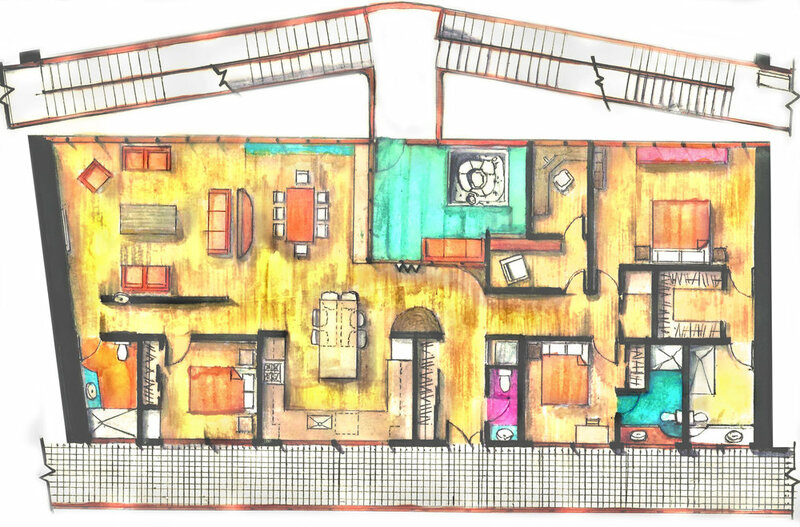 Detail models supplement hand-drawn concept vignettes to showcase the energy and feel of Casa Insurgentes. 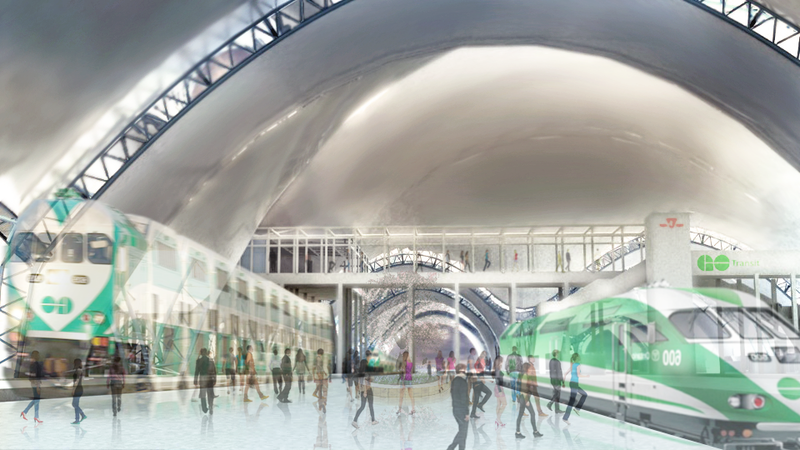 In the parametric option studio, the current Union Station train terminal built by Zeidler Partnership is re-imagined. Interests in fabric architecture led to the consideration of its practical advantage as a train shelter. The membrane structure system is comprised of a modular kit of parts— spanning Photocatalytic PTFE fabric over prefabricated steel arched trusses. A large glazed space frame houses a café and pedestrian walkway creating a cross-grain line of travel. The original site is relieved of an unbecoming heritage building. The now purified ground plane is less obstructive with a light-frame bus terminal shelter. above or below truss chords depending on the length of the bay; shorter bays tension from below. In the latest iteration, diagonal masts were removed due to structural redundancy and interference with the original train tracks. The Union Station intervention is first introduced by a set of evolving animations which showcase varying iterations and arrival of form. 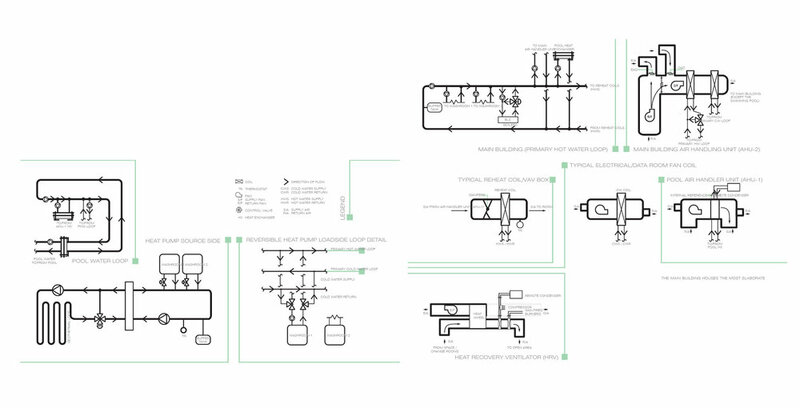 There are typical plans, sections, and appropriate conceptual and performance diagrams. There are also a series of finely crafted connection detail models, including a 1:25 of the mast, and a 1:50 section model. A 4D Schedule details the construction process from start to finish. Unity, a game engine software—is used to allow the viewer a controllable walk-through of the space. As part of a housing studio with Professor John May, a precedent study was introduced to lay the ground for further studies in experimental housing. As part of the Kitagata Apartments in Gifu, Kazuyo Sejima was employed as the principal architect. architecture, by creating a double-height room allowing vertical circulation. Modest Japanese living avails capital to be spent on a rigourous experimentalism in Japanese design. Two (of seven) iterations have adapted the formula of the plan layout of Gifu precinct. (Pictured opposite) These have added elements of flexibility within the plan, such as adaptive curvature and multi-purpose spaces. A pre-engineered, inflatable, mobile bubble structure acts as a rescue post on Blue Mountain in Ontario. This proposal uses ETFE technology to create a minimal impact shelter with a marginal installation cost. A wooden platform along with the essential cuffs, connector joints, railings, and fabric as modular parts can readily consolidate on the trailer of a snowmobile. Flexibility allows the rescue station to dismount and re-deploy wherever necessary. LEDs light the object during night skiing and can be illuminated as a signal in the case of an emergency. 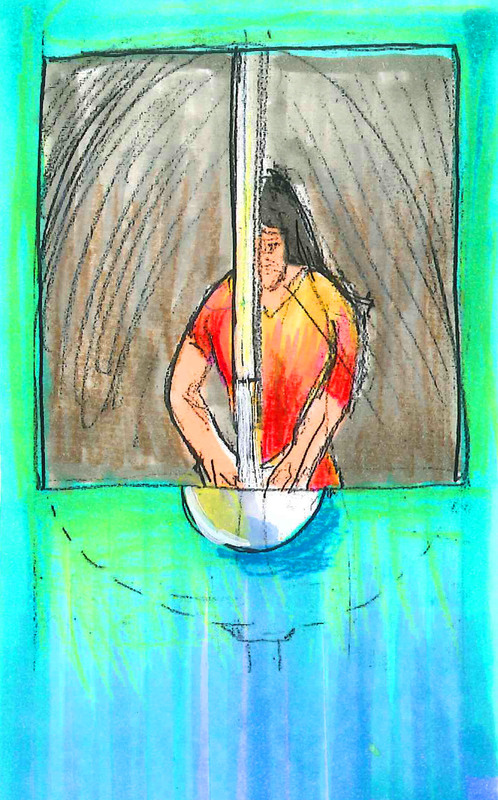 The Sphere then becomes a beacon of hope in an otherwise dark situation. 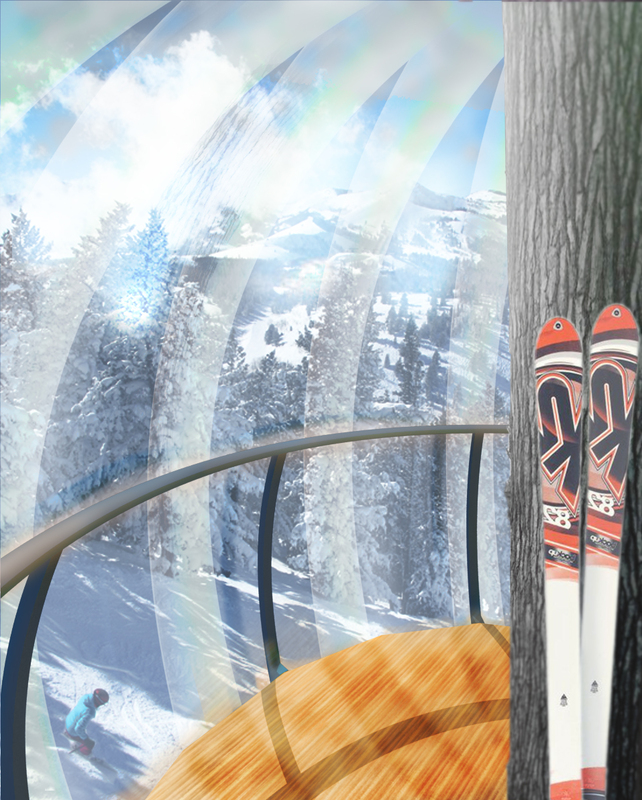 Self-similar air beams inflate to create vertical support in a polar arrangement, designed to handle areas which risk snow ponding. The deck and platform are first built around an adjustable cuff which secure the structure without damaging the tree to which it is mounted. The fabric component wraps around the tree and fastens by polyester lacing at the entrance. The air-supported structure reaches its intended shape by a simple low-speed air pump or a standard bicycle pump. A beam flap with mechanical fasteners seals the front, continuing the spherical surface. ETFE copolymer fabric is chosen primarily for its translucency, allowing for approximately 85% light transmission, while reducing infrared radiation (nearly half that of glass). It will not degrade under UV light or air pollution and is completely recyclable, lasting around 50-100 years, making ETFE the ideal fabric for this application. Plans, sections, elevations, and exploded anoxometric views showcase the form, scale, and function. In-depth structural calculations are aided by illustration and documentations of finite element analysis testing the strength of the air beams. Pictured right is a 1:25 scale model with a segment cut from the spherical element to showcase the interior space. Not pictured is a 1:10 physical detail model demonstrating the relationship of the intervention to the tree, and provides a clearer resolution for the various details which hold the project together. 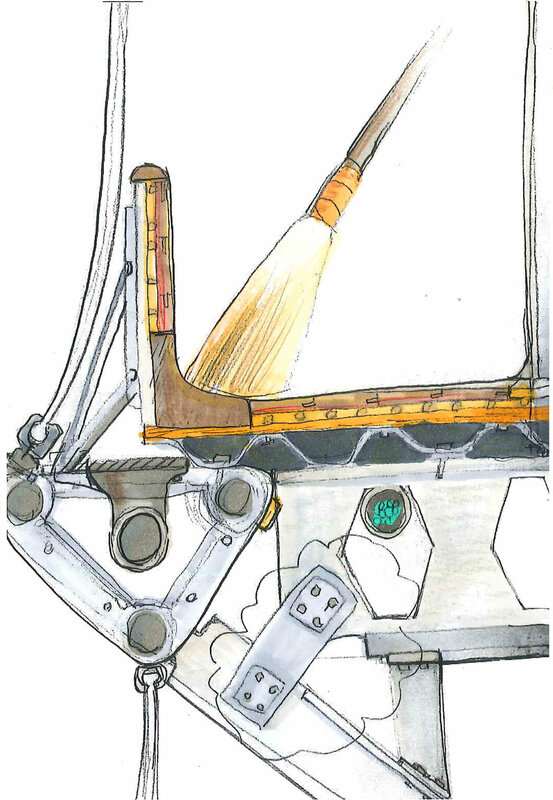 The original concept is represented by hand-drawn sketches, coloured with illustration markers. In the second year of the Masters of Architecture Program, the comprehensive studio engages the practical side of building and designing. 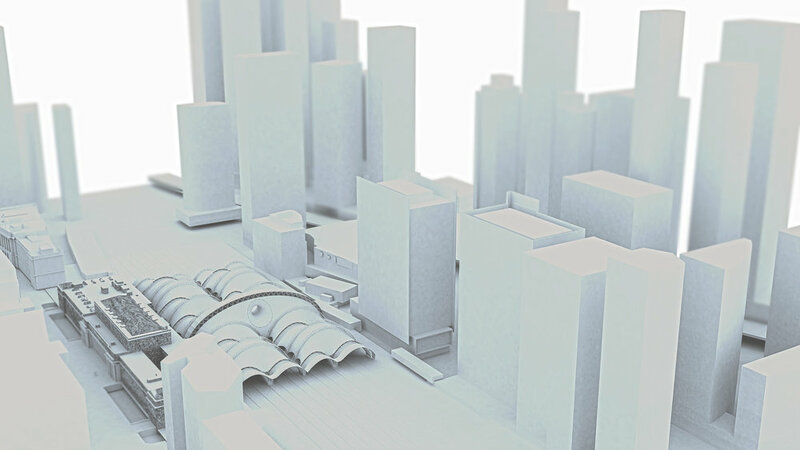 Introducing the urban scale, calculated structure, connection details, building envelope systems, HVAC, Acoustics, and other parts—all account for what amounts to a comprehensive study. Comprehensive studio is the most aligned studio with contemporary architectural practice, requiring detail drawings, site specificity, building code compliance, etcetera. Emphasis in this study is placed on the urban condition, and follows a continuum of language through to the ergonomic scale of the proposed community centre. The design concept extends the program of the nearby parkside high school—creating an axial procession linking to a compartmentalized program. A swimming pool and gymnasium flank a rectangular sunken ice rink, matching the eye level with swimmers in the nearby pool. Alongside the leisure rink is a customized modular fabric structure which houses an NHL regulation indoor hockey arena. The Northwest parking lot begins at a lower grade—taking advantage of the ascending topography to choreograph the desired experience for approaching the main entrance. Ramps carve into the platform that demarcates the entryway. An heroically cantilevered auditorium/multipurpose space toplights the passage below from an aluminum soffit above. The canted reflective glass signals Dufferin Mall goers into the building and visually connects the link between the mall program and the community centre. From a distance, the parking lot reflection reads the word Dufferin. A café and lobby invite passersby through the double width corridor. A developmental centre acts as an extension of an existing program from the nearby high school. On the south side, a farmer’s market expands and animates the space between its exterior and the kitchen. Overall, volumetric spaces are developed to simplify corners and conceal structure. The approach is applied throughout the interior and exterior. Along the interior walls, a band of frosted glass creates a soft indirect light reflected from of the ceiling. The swimming pool has tight requirements for serving its intended purpose. Buffer tanks help regulate temperature and thermostats are used for auxiliary thermal control of the units. The swimming pool needs its own air handling unit, internal refrigeration unit, and remote condensing unit. The double skin facade acts like a solar chimney and has a low level damper on the south side and a high level damper at the top of the parapet on the north side. These dampers operate based on a central automation system, and can adjust to different wind conditions. Separate systems regulate chlorination and dehumidification. The double skin façade acts like a solar chimney and has a low level damper on the south side and a high level damper at the top of the parapet on the north side. These dampers are operable based on a central automation system, and can adjust given wind conditions. There are also systems to regulate chlorination and dehumidification. 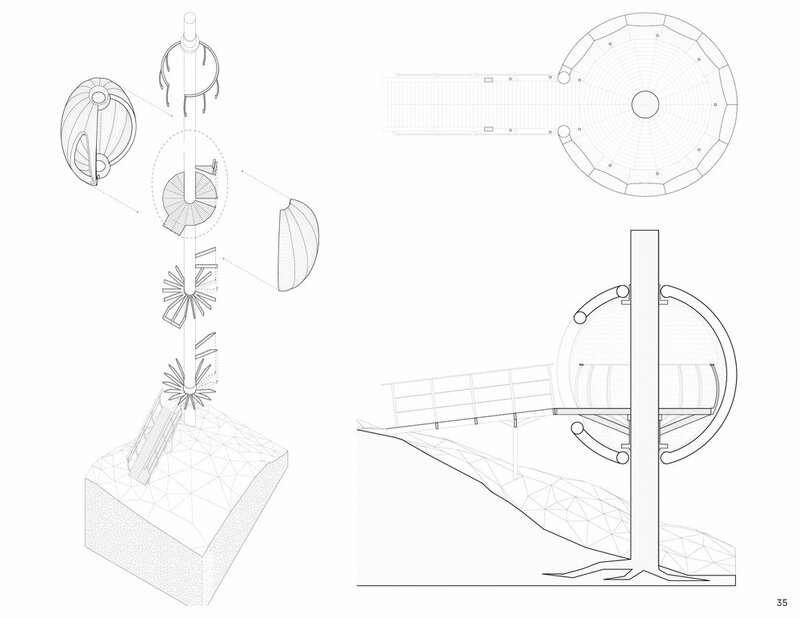 The project was represented by a series of three renderings, plans, sections, isometric projection drawings, connection detail drawings and concept diagrams explaining the environmental systems, structure, parti, lighting, and so forth. 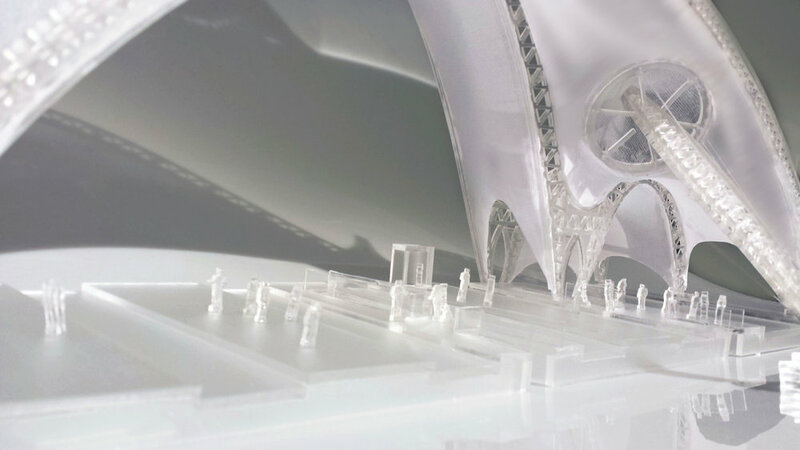 Physical models of key details and an elaborate resin model help to visualize the project. The Dufferin Mall site in Toronto is critically analyzed with respect to a larger urban idea through which architectural systems are filtered. The thesis of this project develops into a discovery process; finding unnecessary limitations imposed on architectural practice. This evolves into an investigation into federal, provincial, and municipal regulation versus intrinsic market regulation, including private regulation (LEED, decentralized alternatives, etcetera) and best practices. 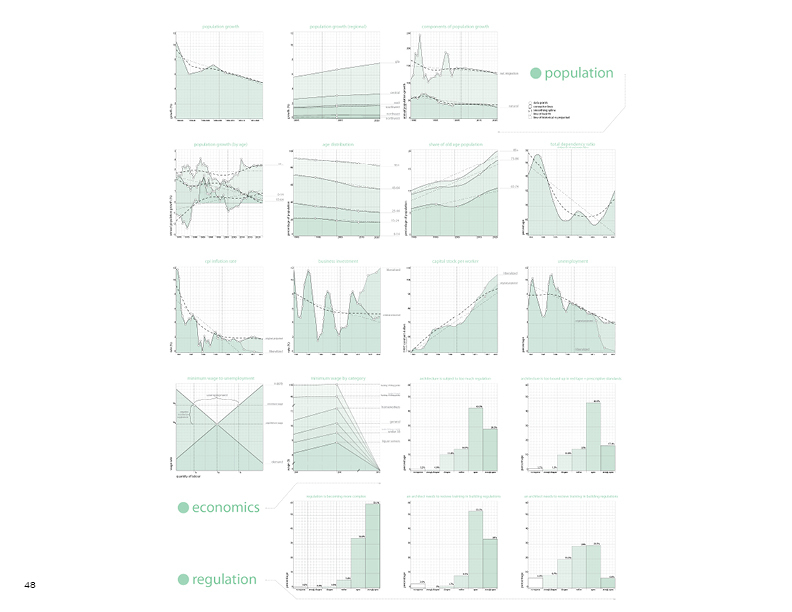 The province of Ontario is analyzed demographically and data is compared with projections from a hypothetical 'economic free zone', where business, labour and investment freedom are maximized. International Studies indicate that building regulations are becoming ever more complex, inaccessible, limiting, prescriptive, and more burdensome overall. Such soft data suggests that architecture as a profession reacts to an oft-removed bureaucratic entity that restricts possibility from a creative field, alongside extant market forces. Architectural design and its relationship to governmental forces is explored in a way that is specific to the context of the following project and the ideas which drive it. Superstudio approaches the urban scale and explore urban design logic. In this case, the notion of a master plan is challenged and replaced with a more adaptive idea, a test site with a base set of “spines” from which to build. The project is built to appeal to a shifting demographic and growing population—in other words, an Era–Dynamic. This housing project aims to be both self-sustaining and commercially profitable. The test site chosen for this project is Dufferin Mall in Toronto, Ontario, Canada. The site is deregulated: zoning is privatized and based on brief contractual agreements; and energy would be generated through an integrated infrastructure. The site approach commences through axioms aware of augmented urban density. 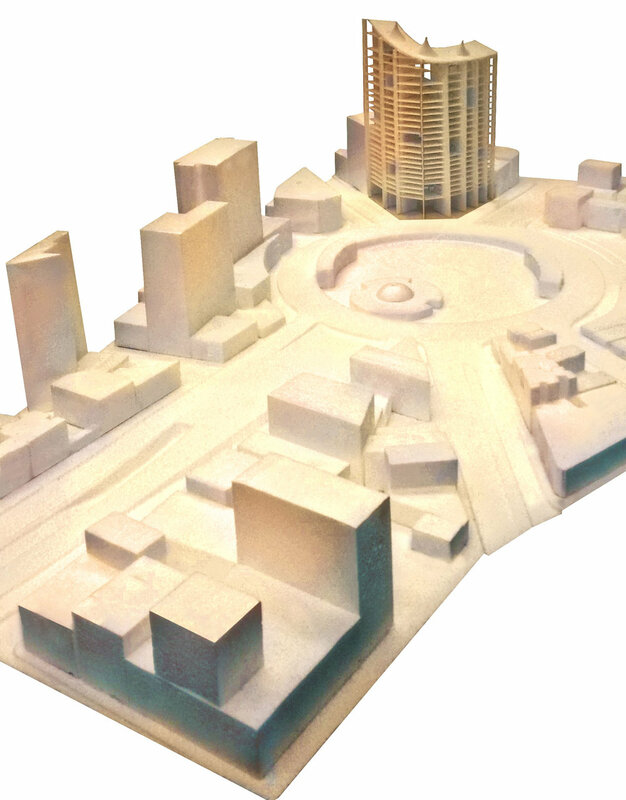 A number of towers, or “spines,” are placed on the site zoned in accordance to private ordinance, whereby contractual agreements between stakeholders are established. The anatomic rhetoric of the spine is populated by modular plugs which provide an infrastructural connection between localized centres and their respective residential units. The residence intends to house a variety of occupants from diverse stages of wealth and to also address a temporal factor whereby families can grow and shrink, and as such, units can expand and collapse—couples can separate, connect, even welcome a newborn into the world. The process of developing the project became experimental yet highly quantitative, calculating estimates to determine how to meet user needs. The way that units are articulated in terms of their energy consumption becomes an operative of their arranged configuration. The self-sustaining feature of the site attempts to involve a number of alternative energy and conservation methods. Above a diverging funnel top which catches rainwater, solar panels exploit the sun path. Wind tunnels diffuse air at the greatest speed at their highest altitude; hence windmills are placed under and around the catchment basin. Water collected is distributed to algal energy units to assist the photosynthetic generation of electricity. Geothermal vertical cores would be placed underground, encircling the foundation. The ecological capital used to promote innovative carbon neutral sites could attract a rising trend in investment. The towers are crafted with a consistent, streamlined language. At the represented time frame, the site accommodates 615 residents. This was calculated based on the input of economic projections from Ontario provincial figures. Despite a longer return on investment, Era–Dynamic could reach energy autonomy. After the tower is developed, a larger move is made to bridge a path to the easterly Dufferin Grove Park. A long arching span responds to gestured paths connecting the park to the site. The bridge establishes circulatory pathways which cross over to the public space at the foot of the towers, bringing permeability to a busy street. “Solar fan” polygons regulate the maximum heights of the five towers, which are placed in response to dominant wind axes. Typologies of the residential units are parametrically generated with a host of configurable parameters; including family size and economy options. There are many choices for individual households—flexible interior partitions, indoor or outdoor pools, balconies, saunas, courtyards, greenhouses, and solariums. At Era–Dynamic, the philosophy of eco-libertarianism applies to further maximum freedom in design with more user-specific accommodations. This project is but one example of the many possible developments. 'Free zones' have been known to rapidly increase living standards and overall prosperity. A repeated tower articulates different energy sources in the most effective arrangement. Solar and water catchment are integrated at the top; followed by wind; an algae tower; modular residences and then geothermal cores extending below the ground. 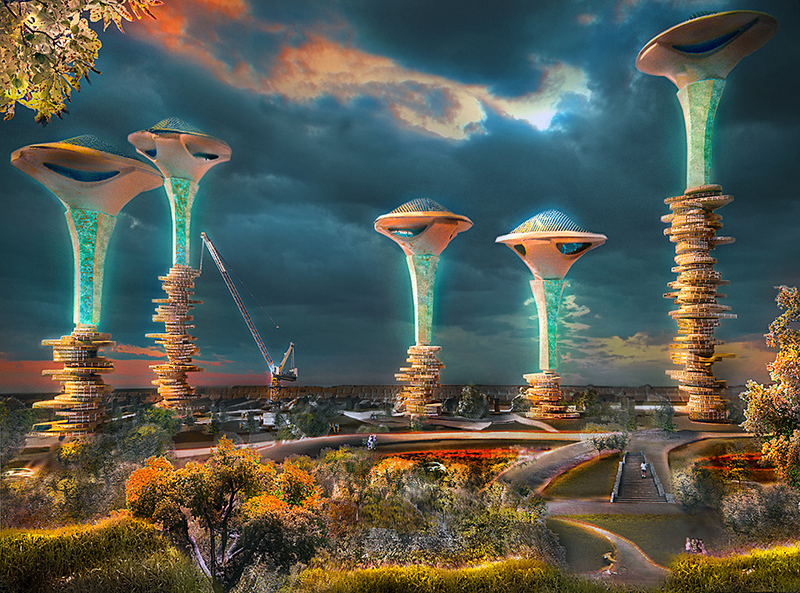 The towers are designed to be both beautiful, adaptive and relatively autonomous. Layout is based around a landscaped bridge spanning Dufferin Road to Dufferin Grove Park. Grading and greenery are playfully improvised around the towers. Desire lines forge pathways mapping human will along the site. Bjarke Ingels Group (BIG), entered a competition in 2006 for the Freja Property Estate in Herstedvester, Denmark. The project had no concept diagrams to explain the underlying logic. Instead, the design logic had to be deduced from a pixelated master plan and model photographs. The project logic is simplified and analyzed with different qualitative and quantitative methods. In terms ofwhat parameters drove the project, much was discovered by measuring areas of pathway networks and residential areas. Each diagram is part of a discovery when existing data is juxtaposed in different ways to determine possible relationships. Many correlations were serendipitously consistent. The tesseract–inspired structure with a translucent PVC cladding offsets generalized volumes of the Ontario Legislative Assembly. Maintenance costs escalate as weathering deteriorates building parts at an increasingrate—One solution could be to integrate a membrane structure. 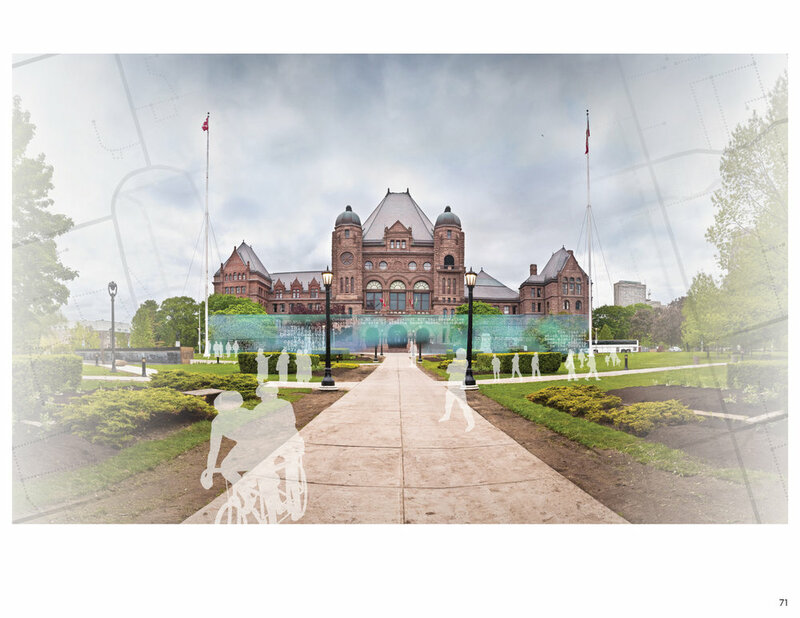 The idea is to create permeability and activity in otherwise impermeable provincial architecture. 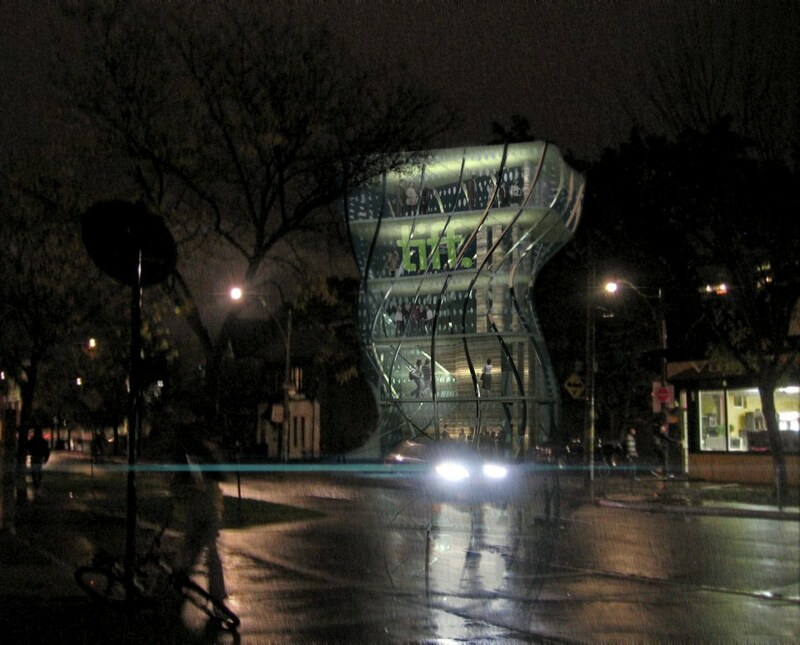 Riverdale Park in Toronto, Ontario is the inclined site for a community center proposal. The project initially developed internally from program coordination, where it was then arranged into simplified ortholinear boxes. One long band of volumetric concrete connects the southeast with a perpendicular curtain wall volume from the southwest, meeting grade at its ends. Two large cantilevers continue out over the intersection, resting atop the concrete base volume. The slenderness of the bands is intended to encourage interaction within an intimate walkthrough. The ceilings are 4.5m high and large glazed boxes open up a wide view onto the park below. The concrete enclosure below serves more private functions, allowing light to filter through subtle reveals along the ceiling perimeter. The main park pathway intersects a sheared box volume along its course, with a window wall along one face of this intersection, providing natural light to the lower level. 1:75 and 1:100 models are crafted with different approaches: one with printed graphics and the other using basswood throughout. 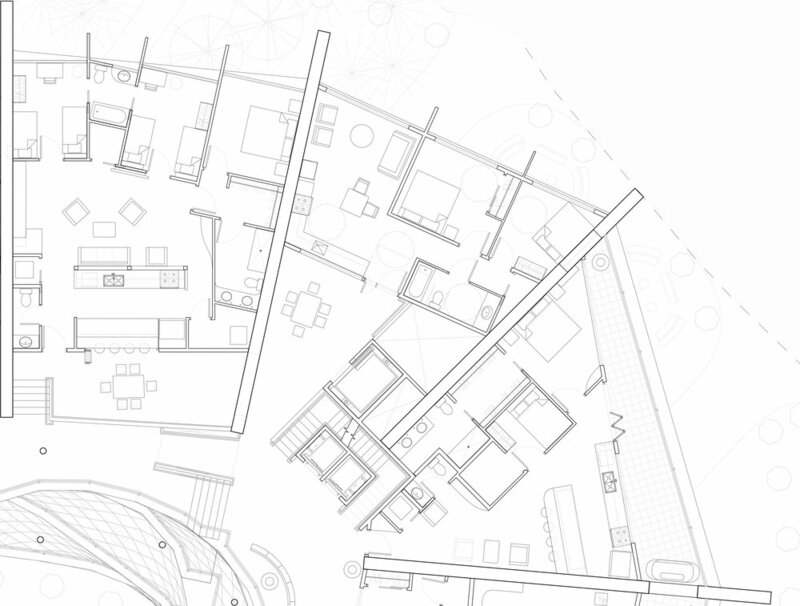 Hybrid drawings give the community centre context and a matrix of diagrams illustrates the various aspects of the project—from structure to the arrival of form. 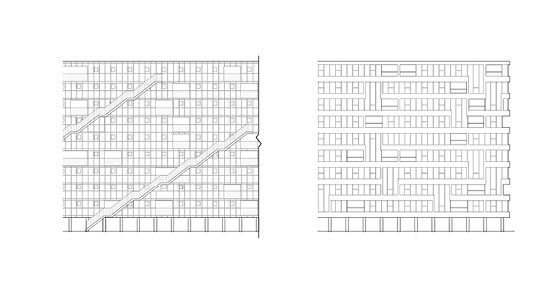 The Void into Stairs project is a development of an infill between two pre-existing buildings. A larger volume intersects three void spaces to meet project requirements. Three relatively distinct geometries were formed based on horizontal, diagonal, and vertical circulation, then the space arising from void intersection is configured. Parametric software helps to generate the most desirable form with quicker iteration and less waste. The next stage was a complete project reboot, where switchback stairs navigate around a central sculptural piece, forming an open atrium. This project discovers its own formalism acquired through physical model testing and aggregation. Compression can be tested through a process of weighting and simple paper folding. A performative geometry is created from structural folds which generate a functional aesthetic.